FIM Group has long taken pride in our independent views. While we don’t necessarily set out to be contrarian, the nature of our value-focused investing often leaves us standing apart from the herd. This month we’d like to share some perspective about why we aim to avoid the herding instinct and how we go about keeping our thinking sharp and unbiased. Our team has long recognized the dangers of “groupthink” or “herding” when it comes to structuring and managing portfolios. Time and time again, investors seeking comfort in numbers flock to the trend of the day. This happens on upswings when greed rules the day and on downswings when fear sets in. The resulting crowding effects drive asset price volatility in markets that far exceeds changes in underlying fundamentals. Inevitably, many pile on during the later stages of the trend or are foolish enough to bring borrowed money to the table. These folks learn the hard way that the safety of the herd has little application in the investing world. 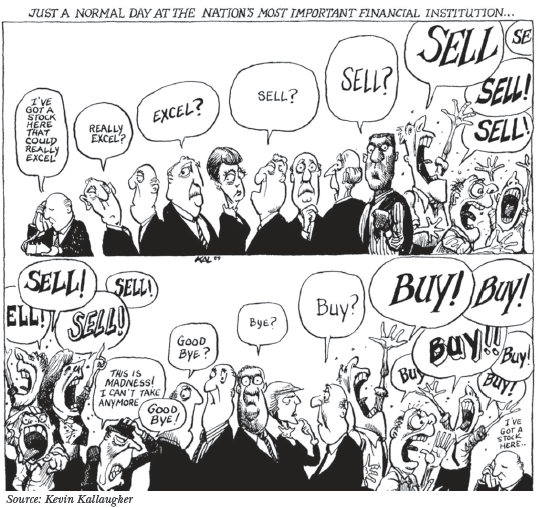 In 1989, Kevin Kallaugher captured these emotional swings and herding instincts with the cartoon below. In the nearly three decades that have passed since then, Kallaugher’s image remains just as relevant. Today, investors equipped with hyper-connected iGad-gets and a smorgasbord of easily traded financial products can get whipped into a frenzy more quickly than ever. Recent herding examples from 2015 alone include the Chinese stock bubble and bust, the FANG (Facebook, Amazon, Netflix, Google) stock boom, the stratospheric rise of Vancouver home prices, and the rout of oil-related stocks. Our job as your investment managers is to be very wary of herd behavior and to stay disciplined with our independent investment decisions. On the latter point, this discipline applies to both mania avoidance when the herd gets greedy and bargain hunting when it turns despondent. A commitment to independent investment thinking offers benefits beyond opportunities for risk and return management at market extremes. It also allows us to search for and invest in the more attractive niche areas that exist outside of the mainstream. The flexibility to invest in non-traditional niche areas is vitally important today. This is because the prolonged period of ultra-low global interest rates (including the many countries now with negative rates!) has pushed the prices of more traditional investments, like many blue-chip dividend-paying stocks, to unattractively expensive levels. One example of such a niche area where we’ve made investments throughout our history is the closed-end fund (CEF) space. CEFs are investment structures about which we’ve communicated quite a bit in these pages, webinars and client meetings over the last year. Unlike traditional open-end funds, CEFs trade on stock exchanges throughout the day at prices independent of the value of their underlying holdings. They are a statistical blip in the grand scheme of “pooled” financial products available to investors today. For example, the entire universe of CEF assets totals only $300 billion or so. This compares to more than $16 trillion in the open-end funds that most investors associate with mutual funds. We like this relatively unknown area for several reasons, but in today’s markets there is one feature we really like. This is the additional return potential available when CEFs are bought at unusually high discounts to their reported net asset values (NAVs). When such discounts “normalize” back toward average levels, or even back to or above NAV in some instances, investor returns benefit as the CEFs’ prices move more than that of their underlying fund holdings. Recently, our portfolio performance was helped by this discount normalization phenomenon. Discounts across many of the fixed-income funds we own in client accounts (primarily in our Balanced, Balanced Conservative and Yield Income strategies) narrowed significantly from the abnormally high levels of late 2015 and early this year. If you closely monitor the trade confirmations in your account, you’ve likely noticed some heightened trading activity with these CEFs. We have been selling funds that witnessed sharp price jumps in recent weeks, primarily due to discount normalization. An example of one of these holdings, the DWS Strategic Income Trust (ticker: KST), is shown in the Figure 1. While the chart breaks out the NAV and share price in the upper portion, the lower portion illustrates this discount normalization. KST’s 17% discount in late 2015 compressed to 8% by mid-March, which added nearly nine percentage points of return during this period relative to similar mainstream open-end mutual fund alternatives. Shifting gears from why we feel investing independently of the herd is important to how we go about doing that, let’s review a few of our key processes. For starters, we train ourselves to be skeptical toward the sizzle sold by much of Wall Street and corporate America. Our investment team members prefer to read company filings (for example, annual reports) footnotes first (where most of the important stuff is buried), while saving the usually sweeter smelling press release bullet points for last. We focus more on balance sheets and cash flow statements and less on income statements. It is the latter where many companies report “funny” numbers like adjusted EPS (earnings per share) and adjusted EBITDA (earnings before interest, taxes, depreciation and amortization). Such figures conveniently omit expenses that, on an unadjusted basis, could make a company’s profitability look far less flattering. Our team also takes a cautious stance toward the stock ratings reported by Wall Street analysts. These analysts, while in most cases are well-informed with the companies and sectors they cover, are often put in a difficult position. The hedge fund clients who effectively pay much of their salaries (by trading through the analysts’ firms) often rank analysts’ access to senior management higher than their ultimate investment ratings. This can lead to stock rating and target price “inflation” as analysts who put a negative rating on a stock may be less likely to gain the future C-suite access that their paying clients covet. Another step we take when scrutinizing our holdings is to be aware of the confirmation bias that can creep into our own internal research process. Confirmation bias is the behavioral trap where one seeks supporting evidence of a given idea and ignores or downplays conflicting data. For example, after spending countless hours getting to know an investment and then recommending to the team that we purchase it, our brains can naturally seek out collaborating evidence that the idea is a good one while treating less flattering data or viewpoints as immaterial or “already baked in” to the current market price of the security. Our investment staff meets formally twice a week as a team, and one of the things we try to do at these meetings is to challenge any potential confirmation bias that has crept into our portfolios. We ask each other critical questions about the assumptions we’ve made on a given investment thesis and whether or not these are still valid. Acknowledging changes to these assumptions or the significance of adverse developments is not always easy, especially if doing so means ultimately deciding to take a loss. Last year, when we bought Kinder Morgan (KMI) for select accounts, it wasn’t long before we began to see evidence that stress was mounting throughout the energy sector. Team members raised concerns that this stress could significantly impact KMI’s growth outlook and put its dividend at risk. We ended up selling the holding at a modest loss not long after adding it to portfolios, which never feels good. But by countering potential confirmation bias with open team discussion, we prevented a much steeper loss. A third aspect of our independent investment process is the integration of environmental, social and governance (ESG) factors into our analysis. While many investors view these issues as those that only “tree huggers” or “bleeding hearts” should care about, we beg to differ. Indeed, we believe that the standards and actions of a company in these ESG areas are mission-critical to the corporate resilience that ultimately supports a company’s ability to deliver long-term value to its shareholders. For example, how will companies that treat their employees poorly retain and attract the talent needed to sustain their future long-term performance? And how long can a company abuse the environment or even its customers in the name of short-term profitability before brand damage, regulation and/or litigation drowns out any future profit potential? While companies showing little concern toward major ESG “defects” can still capture the attention of momentum of chasing speculators, we generally try our best to keep them out of our managed portfolios. The risks that lie underneath the surface of these single-bottom-line focused companies are often woefully underestimated by the investing public. If there’s a current poster child for groupthink gone awry and the importance of independent analysis, Canada’s leading Big Pharma company, Valeant Pharmaceuticals International, seems to fit the bill. Valeant’s stock soared five-fold from 2013-2015 as analysts and big-time money managers alike fell in love with its unique approach to the drug biz. At its peak last year, it was Canada’s largest listed company by market value. Valeant’s business model centered on borrowing money to acquire companies with approved drugs in areas with little competition. It would then typically fire most of the R&D staff of the acquired companies to cut costs and raise drug prices as high as they could get away with. This strategy worked for years, at least as measured by the “adjusted” financial metrics that management touted and analysts regurgitated in report after report. The herd kept piling in and Valeant’s share price chugged higher and higher. As Figure 2 shows, as of 7/31/15, when the stock traded at around $250/share, most of the analysts following it expected the good times to just keep on rollin’. But as summer yielded to fall, cracks began to appear. In October, independent research firm Citron Research published a report that accelerated a flurry of regulatory scrutiny over Valeant’s drug distribution and pricing practices. Citron’s report had a sensational flare, comparing the company to Enron, but it ultimately exposed major flaws in the Valeant business model and its financial reporting. If that weren’t enough, Hillary Clinton recently called out the company on her campaign trail as a symbol of all that’s wrong with the pharmaceutical industry (if you watch any TV, you’ve likely seen her political ads centered on this). Then, in mid-March, Valeant management had to admit that its financials needed more scrubbing. This, among other things, may even lead them to default on their debt. Needless to say, the share price had cratered, and big-time investors like Pershing Square, T. Rowe Price and ValueAct Holdings are stinging from billions in lost market value on their Valeant stock holdings. 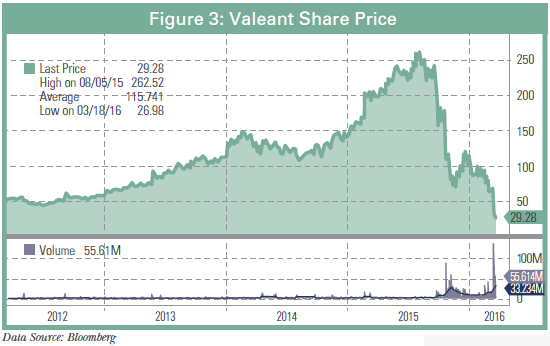 Valeant was never a stock we considered for investment at FIM, but it’s become a great example to learn from and a reminder of how important independent thinking is to investing success. Thankfully, our team has never taken much comfort in investments (either owned or under consideration) that happen to come highly recommended or highly owned by some of Wall Street’s smartest analysts and fund managers. If anything, such conditions, when they exist, tend to make us more critical toward our own assumptions. We also strive to be ever-vigilant toward herding tendencies, skeptical of adjusted financials, alert to confirmation bias and demanding of high ESG standards with every investment we make in managed accounts.